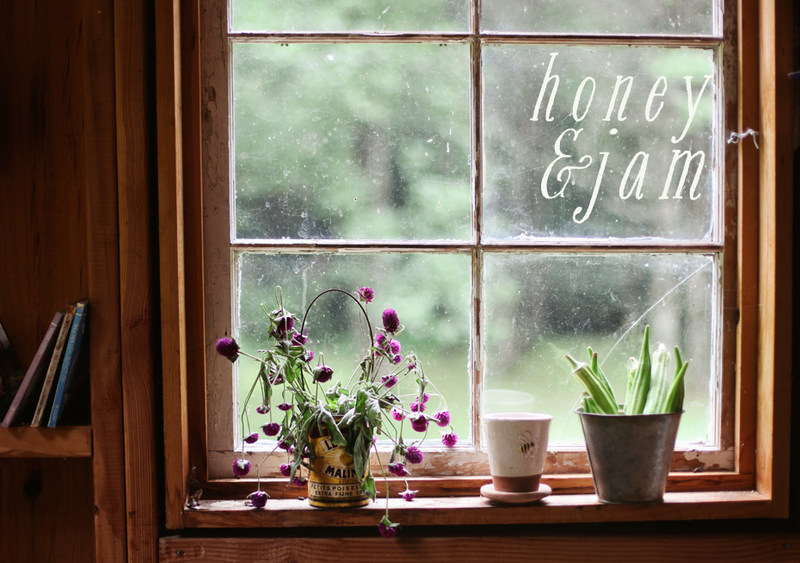 honey & jam | recipes + photos: Giveaway! I really love pinch bowls. As you can see here, here, here, and here. They are pretty much a necessity in my kitchen, perfect for measuring out extracts, spices, baking powder and all of those little things too small to put in a big bowl. They also work really well to scoop flour. Seriously guys, these things are great. 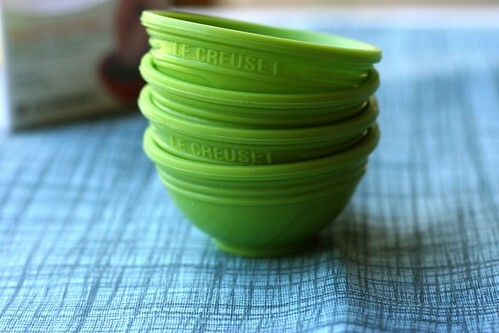 So today I’m giving away some of my new favorites, this cute set of 4 1/4 cup le creuset green pinch bowls. Enter once by leaving a comment on this post and a way to contact you if you don't have a blog. No entires after 10 pm EST next Wednesday, April 29th. I’ll select one winner through random.org next Thursday Morning. Yeah! I'm the first. Those bowls are so pretty, hope I win! Oh wow, those really are absolutely adorable. And the fact that they're green just makes it even better! I can see why you love them. They're fabulous! Very nice. I've wished for a set of these a few times. Those pinch bowls look so cute! I don't have a set because I'm sooo lazy when it comes to dishes. I think they would help cut down on forgetting to add ingredients like salt or baking powder! Wow. I really have a "thing" for little bowls right now. I can't help myself when I see then for an awesome price second hand. These look adorable! Pinch bowls are the best! I love having one by the stove for salt. These are so cute! So excited about Le Creuset pinch bowls! Also, I really enjoy your blog. It's one of my staples. Well, if i don't win I guess i may have to buy, or put on my wish list!! Le Creuset can do no wrong aside from being crazy expensive, great colors, quality products. My whole Amazon wishlist is filled with their stuff. oh man! super cute! 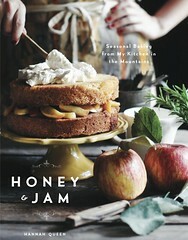 and i've been coveting some, so i can start doing the whole mis en place thing. Those pinch bowls are so cute! And they're green, too- my favourite colour! Thanks for the giveaway Hannah! Those bowls are so pretty. I love green! I love pinch bowls too - these are adorable!! Oh, I love! I have pops of that shade of green all over my house, so I definitely want it!! Love them! They would look great in my kitchen! I have neither pinch bowls NOR green bowls in my kitchen. Do you ship overseas??? Ah!!! The cuteness! I wants them! oh these are just so pretty!! Great site. I'll be back to visit again soon. ooh fantastic. I love to bake, so these would be perfect for measuring out sugars and salts and baking powders. Thanks for the lovely prize! Found your giveaway via FoodGawker! Thanks so much. I'm adding you to my bloglines too! Pinch bowls! Purdy green! I don't have a twitter or a blog. Sad face. :-( Maybe I'll win anyway! Yay! Cute little bowls! They'd find much use in my home! Lovely little bowls. Thanks for the opportunity to enter! Pinch, I love Pinch everything. Like Scotch, bowls, cheeks, haha. Yes please! :) Lovely blog, I am so glad that I happened to find it! So excited to read around more, everything looks AWESOME! I just came across your lovely blog and I am loving it! The pinch bowls are sweet. I'm so excited about this give away. Thanks!! blogged! thanks for letting me borrow your lovely picture too. I would love to win, would be so useful! Those are adorable! I love the color. I never win anything though, so I'm not holding out much hope. Ohhhh, those are the perfect addition to my arsenal. I'd love to win! I just discovered your blog via tastespotting! Gorgeous photos! I am a first year culinary student (finally living my dream!) and I love these things. Thanks for making the giveaway possible. Love your site! And I, too, have a thing for pinch bowls! I just added these to my Amazon wishlist yesterday! They're adorable. Love the color. i like these little bowls! these are so cute, thanks for the chance to win them! green pinches are my favorite. Those are *SUPER CUTE*! I love the color! Very cute! I would love to win these. Also, I enjoy your blog. Keep up the great posts! greens for me!! hope i win! Wow! I have never really seen these around before! It will be cool if I can get my hands on these! Gasp! I looooove green. And those seem quite nifty. Cute bowls! I hope the giveaway ones are green! Oooh I adore pinch bowls!!! Hey, I just found your blog (through foodgawker.com). I'm adding it to my bookmarks! I use ramekins a lot for small amounts of spices and salt and stuff but these would be much nicer. so cute! They would be perfect in my new apartment's kitchen! Wow, what cute bowls :) I think it'd be awesome to have 1/4 cup bowls to get perfect little portions! Thanks for the giveaway! Want! Those little bowls are perfect for a mise en place. What a wonderful site! I have enjoyed browsing through it, and have it bookmarked. I hope I win these bowls - they would sure be better than what I'm doing now, which is using various measuring cups! Thanks for offering these to us. It's very generous - and can you tell us where to purchase them? The Pinch bowls look so handy! How cute! I love your blog, I found you through foodgawker. Awesome blog. I just found you through DB and you sound like such an awesome girl (homeschooling...I will have to follow your blog now and someday ask you all about your experience ok? My husband wants our kids homeschooled, and sometimes, I do too, but sometimes...hmm). Thanks for the giveaway! the bowls look really cute! These are real beautiful bowls. Best of luck to me and to all! I definitely agree, they are perfect! Great giveaway! I just love those bowls and the color matches my kitchen. What pretty little bowls! i'd love to give them a home! Thanks! These would definitely be appreciated in my kitchen! I just love the green color!! greeeeen! adorable little bowls. love them! Those are great + the color is fantastic! Ohh how exciting. I love the color! Love to have those bowls! These pinch bowls are adorable! I'm a sucker for silicon ware. Those little bowls would come in very handy. By the way, you're blood orange yogurt cake was delish! Note to fellow commenters.. Please don't leave your email address in the comment section in any form. (I did it 6 months ago , disguised I thought), & still get 5-8 spam emails a day. Google your email ID & see how easy it is for spammers to get hold of you. They look great! I'd love to win them! I could use a set of these! So cute :-) Thanks for the giveaway. Le Creuset and silicon?!?! I never knew! CUTE. Please check out my blog for contact info! I love those! No blog, so use cabingirl at gmail. Thanks! These are so cute! Please enter me! Yeah! I LOVE green and I LOVE pinch bowls!! Thanks for the opportunity! What a wonderful giveaway! I love anything le creuset! Aw, these look cute. Thanks for the thought! The bowls are great! Thanks for the giveaway. I'm not sure how you will make your decision or if this is even the way to enter, but....I really have been think a lot about how handy some little bowls like this would be. Obviously I was directed here by the food gods. Love it. ooh i must have these! they are absolutely adorable. here's another - just twittered too! How nice! I thought they only did cookwear!! oh my, these things are adorable. Those bowls are so cute! I have some melamine ones from Martha Stewart at Macy's -- they're just the right size for a few nuts or a small orange for my kids. I love anything le creuset! i've never been pinched by a bowl before but i'm ready! these bowls are lovely... they would get so much use in my kitchen (and my kids would just love them too!). What a lovely green...all of Le Creuset's stuff is pretty! Would love to win these as they'd be so handy to have. Thanks for the chance to win. I absolutely love Le Creuset anything, and the green is so pretty! Love your blog. Enter me please. So cute! I'd love to win those. Those are so cute! 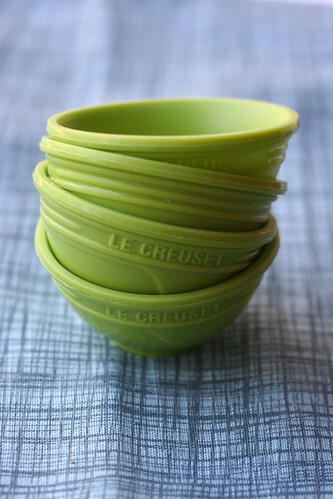 I would love to have some le creuset pinch bowls to replace the plastic ones I use right now! Of course I want your cute little pinch bowls! I posted about this on my blog! I love these green little bowls! Very cute! I'd love to win. these are super cute :) great idea! Last minute contest entry, hehe. I love just about anything from LeCreuset! wow you bowls are so cute and amazing! green is my favorite color!!! Love the beautiful green color of the pinch bowls. 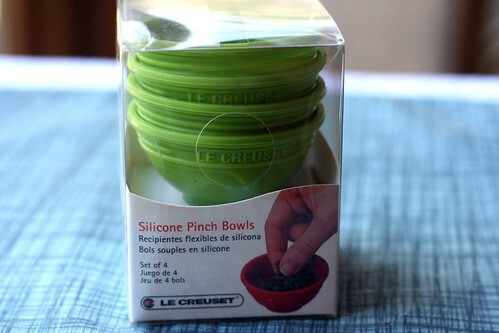 What sweet and very useful little bowls. And they'd look great in my green kitchen. What a great giveaway! Love your blog - I wish I had your baking and photography skills! I'd like to enter! Those are so cute! would love pinch bowls for my kitchen! This sounds neat. All right, I'll try! I am a new reader of your blog. The cheesecake recipe sounds yummy and not so difficult. I shall give it a try. Like the bowls too.